Sixty years ago today George VI died and his eldest daughter, Elizabeth ascended to the throne as Queen Elizabeth II. It has been a remarkable reign during which time she has seen twelve British prime ministers and as we know, the world has changed incredibly. If you look at any coin with the Queen’s portrait on it you will see round her head ‘ELIZABETH II D.G. REG. F.D.’ This is short for ‘Elizabeth II Dei Gratia Regina Fidei Defensor’. This can then be translated as ‘Elizabeth II, by the Grace of God, Queen, Defender of the Faith’. The simple facts of Jesus’ life give us little clue as to the influence he was to have on the world. As a boy he learnt his father’s trade as a carpenter. He then became a preacher, recruiting twelve supporters to help him. But his ministry only lasted a few years and he himself never wrote anything down. In his early thirties he was arrested, tortured and crucified with two criminals. His death might have been the end of the story, but then came the resurrection and with it the foundation of the Christian faith. Even in our very material age the impact of Christ’s life is all around us. If you want to see an expression of Christian faith you have only to look at our aweinspiring cathedrals and abbeys, listen to their music, or look at their stained glass windows, their books and their pictures. But the true measure of Christ’s influence is not only in the lives of the saints but also in the good works quietly done by millions of men and women day in and day out throughout the centuries. Many will have been inspired by Jesus’ simple but powerful teaching: love God and love thy neighbour as thyself – in other words, treat others as you would like them to treat you. His great emphasis was to give spirituality a practical purpose. “For me, as a Christian, one of the most important of these teachings is contained in the parable of the Good Samaritan, when Jesus answers the question, Who is my neighbour? It is a timeless story of a victim of a mugging who was ignored by his own countrymen but helped by a foreigner, and a despised foreigner at that. “I hope that, like me, you will be comforted by the example of Jesus of Nazareth who, often in circumstances of great adversity, managed to live an outgoing, unselfish and sacrificial life. Countless millions of people around the world continue to celebrate his birthday at Christmas, inspired by his teaching. He makes it clear that genuine human happiness and satisfaction lie more in giving than receiving; more in serving than in being served. “Although we are capable of great acts of kindness, history teaches us that we sometimes need saving from ourselves – from our recklessness or our greed. God sent into the world a unique person – neither a philosopher nor a general, important though they are, but a Saviour, with the power to forgive. Forgiveness lies at the heart of the Christian faith. It can heal broken families, it can restore friendships and it can reconcile divided communities. It is in forgiveness that we feel the power of God’s love. Descend to us we pray. We should be thankful to God for our Queen, irrespective of our views of the monarchy as a whole, for in her we have a great evangelist to our nation. For sure she is and should be an inspiration for us all, she sets a good example in how she acts and lives out faith. I wish her well and a long reign to. On faith she speaks from a position of knowllege and personal conviction. She gives clarity in areas some bishops fear to tread. 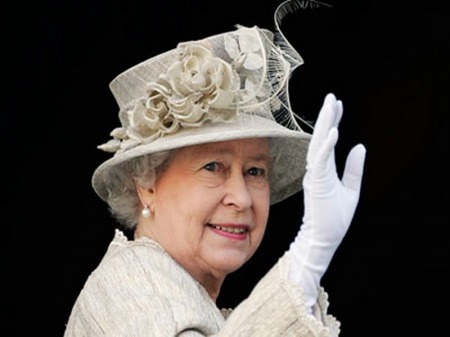 The Queen is an inspiration as an example of selfless devotion to service of others and of God. Her Christmas message 2011 articulating so well her active Christian faith. It is ironic though that although she is ‘supreme governor’ of the Church of England, the title ‘Fidei Defensor’ was bestowed on Henry VIII by the Pope in recognition of King Henry’s essay defending the Roman Catholic doctrine of transubstantion. This was of course before Henry fell out with the Pope and unilaterally declared the Church of England independent of Rome. Henry kept the title ‘Defender of the Faith’, as did subsequent monarchs down to this day, whatever they believe concerning the Real Presence of Christ in the bread and wine of Holy Communion. The C. of E. Book of Common Prayer, in Article 28 of the 39 Articles, specifically repudiates the idea of transubstantion (change in the substance of Bread and Wine). So is this title used under false pretences? Thanks Nancy for filling me in on this. The title was revoked by the Pope when Henry VIII split from Rome, but was then restored by the English Parliament in 1544. In a turnaround, Henry was now defending the protestant faith from the Catholic Church in the eyes of Parliament now that he was thead of the Church of England. This is all very historical, but I still am glad that our monarch is officially the head of the Church of England even though in practice it doesn’t mean a great deal. It shows that our nation is tied to the Christian faith and defines who we are as a country as it has been for centuries despite what some people might like to think these days. The coronation of Queen Eluzabeth II was made under the authority of the One Creator God , Jehovah, whose identity is specific to Jesus Christ, His Son. right to worship any god. The queen has thus denied the preeminence of the One and Only God Creator and is thus no longer queen under the grace of the One True God. She is not defender of the One faith but. a defender of the image of the beast, of the king of the north…of the belief in freedom of self-rights. I’d be interested to read the quote that you have taken this from. Do you mean she has said it is acceptable for people to practice religions other than that of the Christian faith or that all gods are equal?